Mr. Andy Velishek is celebrating a homecoming of sorts with his return to Most Holy Redeemer School. As a former HRS graduate, Andy returns to classroom – this time teaching. He’s excited to be a part of the wonderful family of HRS! 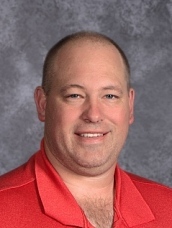 After earning his degree in Physical Education from Gustavus Adolphus College in St. Peter, Andy spent his first five years teaching and substitute teaching in various schools around Montgomery. For the last ten years, he has worked in various jobs from construction to retail. After leaving the corporate world, Andy choose to become a stay-at-home dad and started Child’s Play Theatre Company. Since 2012, he has shared his passion for theatre with thousands of students from across Southern Minnesota. Andy and his wife, Laura, live in Montgomery with their three boys. While not in the classroom or spending time with his family, Andy spends countless hours to perfect his love of theater.